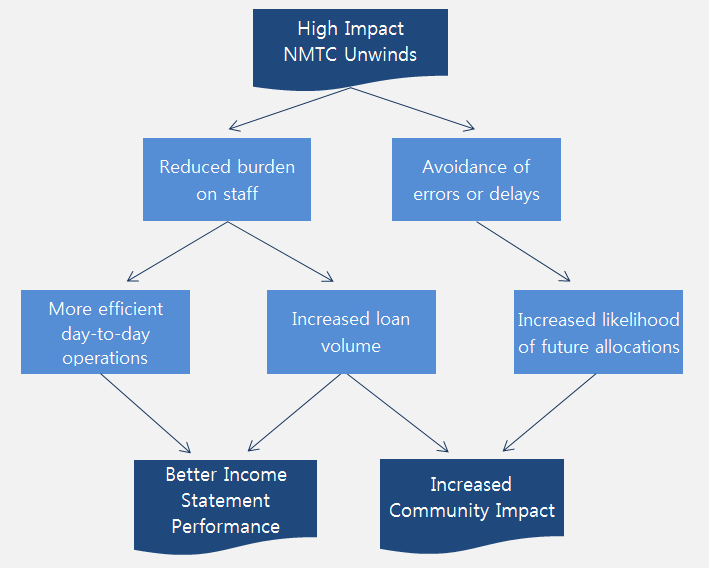 What does it take to pull off a successful NMTC unwind? Start early. Just like in other areas of community development, a good rule of thumb is to expect complications. The earlier you start, the more time you will have to resolve any difficulties or ambiguities. High Impact can prepare a preliminary Unwind Transaction Guide at any time--even right after you close the transaction. Don't overlook the details... All closing documents are different, so you should not assume you know what the unwind will look like before reviewing all the relevant documents in depth. Checking account balances and referencing recent CDE and investment fund audits are also key to preventing surprises on the day of the unwind. This is where High Impact’s experience can save you time and protect your return and reputation. ...but don't forget about the big picture. The start of any unwind is at the QALICB level. If the QALICB doesn't have the funding necessary to repay its debt, the mechanics of the unwind are irrelevant. Taking the time to help secure financing for your QALICB, if necessary, should be your primary focus. High Impact can give you more time to tackle that challenge by managing the unwind for you. Call us at (518) 599-0482 or email us at unwinds@highimpactanalysis.com to discuss your unwind today, or view our NMTC Unwinds informational flyer below for more details.